Alright. 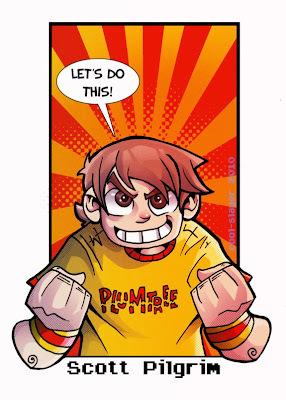 You've been hanging out here for a while, plus you might know me from twitter and facebook too, and if that's the case, you know I think Scott Pilgrim is pretty much the coolest thing since the dawn of times. I really love the comic and I couldn't be more excited for the movie and the game. I mean, did you see those trailers? Epic stuff. Well, when the first movie teaser came out, I made this drawing. I did it very quickly (it's pretty much a glorified sketch), but I had to draw something Scott-related. Ta-da! I'm sorry that this isn't exactly new work, but I'm still dealing with a horrible lack of drawing time. I hope you enjoy this either way!